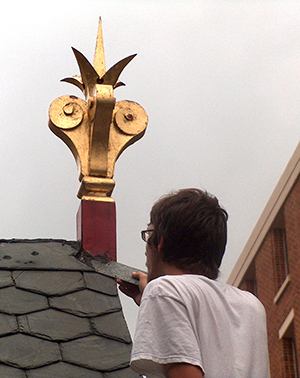 Maintenance helps preserve the integrity of historic structures. If existing materials are regularly maintained and deterioration is significantly reduced or prevented, the integrity of materials and workmanship of the building is protected. Proper maintenance is the most cost effective method of extending the life of a building. As soon as a building is constructed, restored, or rehabilitated, physical care is needed to slow the natural process of deterioration. An older building has already experienced years of normal weathering and may have suffered from neglect or inappropriate work as well. Decay is inevitable but deterioration can accelerate when the building envelope is not maintained on a regular basis. Surfaces and parts that were seamlessly joined when the building was constructed may gradually become loose or disconnected; materials that were once sound begin to show signs of weathering. If maintenance is deferred, a typical response is to rush in to fix what has been ignored, creating additional problems. Work done on a crisis level can favor inappropriate treatments that alter or damage historic material. There are rewards for undertaking certain repetitive tasks consistently according to a set schedule. Routine and preventive care of building materials is the most effective way of slowing the natural process of deterioration. The survival of historic buildings in good condition is primarily due to regular upkeep and the preservation of historic materials. Well-maintained properties tend to suffer less damage from storms, high winds, and even small earthquakes. Keeping the roof sound, armatures and attachments such as shutters tightened and secured, and having joints and connections functioning well, strengthens the ability of older buildings to withstand natural occurrences. Over time, the cost of maintenance is substantially less than the replacement of deteriorated historic features and involves considerably less disruption. Stopping decay before it is widespread helps keep the scale and complexity of work manageable for the owner. This Preservation Brief is designed for those responsible for the care of small and medium size historic buildings, including owners, property administrators, in-house maintenance staff, volunteers, architects, and maintenance contractors. The Brief discusses the benefits of regular inspections, monitoring, and seasonal maintenance work; provides general guidance on maintenance treatments for historic building exteriors; and emphasizes the importance of keeping a written record of completed work. Understanding how building materials and construction details function will help avoid treatments that are made in an attempt to simplify maintenance but which may also result in long-term damage. It is enticing to read about “maintenance free” products and systems, particularly waterproof sealers, rubberized paints, and synthetic siding, but there is no such thing as maintenance free when it comes to caring for historic buildings. Some approaches that initially seem to reduce maintenance requirements may over time actually accelerate deterioration. Figure 1. Maintenance involves selecting the proper treatment and protecting adjacent surfaces. 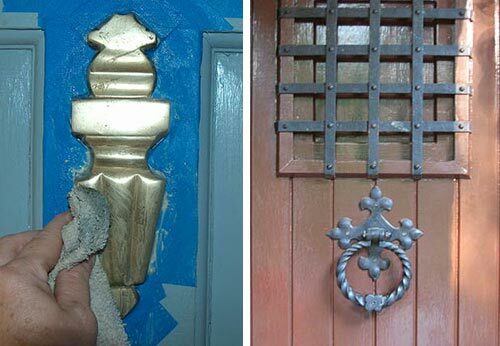 Using painter's tape to mask around a brass doorknocker protects the painted door surface from damage when polishing with chemical compounds. On the other hand, hardware with a patinated finish was not intended to be polished and should simply be cleaned with a damp cloth. Exterior building components, such as roofs, walls, openings, projections, and foundations, were often constructed with a variety of functional features, such as overhangs, trim pieces, drip edges, ventilated cavities, and painted surfaces, to protect against water infiltration, ultraviolet deterioration, air infiltration, and pest infestation. Construction assemblies and joints between materials allow for expansion and contraction and the diffusion of moisture vapor, while keeping water from penetrating the building envelope. Older buildings use such features effectively and care must be taken to retain them, avoiding the temptation to reduce air infiltration or otherwise alter them. Monitoring, inspections, and maintenance should all be undertaken with safety in mind. Besides normal safety procedures, it is important to be cognizant of health issues more commonly encountered with older buildings, such as lead-based paint, asbestos, and bird droppings, and to know when it is necessary to seek professional services (see sidebar). Original building features and examples of special craftsmanship should be afforded extra care. The patina or aging of historic materials is often part of the charm and character of historic buildings. In such cases, maintenance should avoid attempts to make finishes look new by over-cleaning or cladding existing materials. As with any product that has the potential to harm historic materials, the selection of a cleaning procedure should always involve testing in a discreet location on the building to ensure that it will not abrade, fade, streak, or otherwise damage the substrate (Figure 1). Care should be taken when working with historic materials containing lead-based paint. For example, damp methods may be used for sanding and removal to minimize air-borne particles. Special protection is required for workers and appropriate safety measures should be followed. Materials encountered during maintenance work, such as droppings from pigeons and mice, can cause serious illnesses. Appropriate safety precautions need to be followed. Services of a licensed contractor should be obtained to remove large deposits from attics and crawlspaces. Heat removal of paint involves several potential safety concerns. First, heating of lead-containing paint requires special safety precautions for workers. Second, even at low temperature levels, heat removal of paint runs the risk of igniting debris in walls. Heat should be used only with great caution with sufficient coverage by smoke detectors in work areas. Work periods need to be timed to allow monitoring after completion of paint removal each day, since debris will most often smolder for a length of time before breaking out into open flame. The use of torches, open flames, or high heat should be avoided. Many chemical products are hazardous and volatile organic compounds (VOC) are banned in many areas. If allowed, appropriate respirators and other safety precautions are essential for use. Personal protection is important and may require the use of goggles, gloves, mask, closed-toed shoes, and a hard hat. Electrical service should be turned off before inspecting a basement after a flood or heavy rain, where there is high standing water. Organizing related work into a written set of procedures, or a Maintenance Plan, helps eliminate duplication, makes it easier to coordinate work effort, and creates a system for prioritizing maintenance tasks that takes into account the most vulnerable and character-defining elements. Record-keeping sections for work completed, costs, warranty cards, sample paint colors, and other pertinent material. This information can be kept in one or more formats, such as a three-ring binder, file folders, or a computer database. It is important to keep the files current with completed work forms to facilitate long-term evaluations and planning for future work (Figure 2). Proper maintenance depends on an organized plan with work prescribed in manageable components. Regular maintenance needs to be considered a priority both in terms of time allotted for inspections and for allocation of funding. Maintenance work scheduling is generally based on a variety of factors, including the seriousness of the problem, type of work involved, seasonal appropriateness, product manufacturer’s recommendations, and staff availability. There are other variables as well. For example, building materials and finishes on southern and western exposures will often weather faster than those on northern or eastern exposures. Horizontal surfaces facing skyward usually require greater maintenance than vertical ones; in regions with moderate or heavy rainfall, wood and other materials in prolonged shadow are subject to more rapid decay. Maintenance costs can be controlled, in part, through careful planning, identification of the amount of labor required, and thoughtful scheduling of work. Maintenance schedules should take into account daily and seasonal activities of the property in order to maximize the uninterrupted time necessary to complete the work. Institutions generally need to budget annually between 2 and 4 percent of the replacement value of the building to underwrite the expense of full building maintenance.2 Use of trained volunteers to undertake maintenance can help reduce costs. Exterior inspections usually proceed from the roof down to the foundation, working on one elevation at a time, moving around the building in a consistent direction. On the interior, the attic, inside surfaces of exterior walls, and crawlspaces or basements should be examined for signs of potential or existing problems with the building envelope. The following chart lists suggested inspection frequencies for major features associated with the building’s exterior, based on a temperate four-season climate and moderate levels of annual rainfall. For areas of different climate conditions and rainfall, such as in the more arid southwest, the nature of building decay and frequency of inspections will vary. For buildings with certain inherent conditions, heavy use patterns, or locations with more extreme weather conditions, the frequency of inspections should be altered accordingly. Note: All building features should be inspected after any significant weather event such as a severe rainstorm or unusually high winds. Survey observations can be recorded on a standardized report form and photographs taken as a visual record. All deficient conditions should be recorded and placed on a written schedule to be corrected or monitored. For purposes of this discussion, the principal exterior surface areas have been divided into five components and are presented in order from the roof down to grade. While guidance for inspection and maintenance is provided for each component, this information is very general in nature and is not indeed to be comprehensive in scope. Examples have been selected to address some typical maintenance needs and to help the reader avoid common mistakes. The roof is designed to keep water out of a building. Thus one of the principal maintenance objectives is to ensure water flows off the roof and into functional gutters and downspouts directly to grade and away from the building—and to prevent water from penetrating the attic, exterior walls, and basement of a building. (Note: Some buildings were designed without gutters and thus assessments must be made as to whether rain water is being properly addressed at the foundation and perimeter grade.) 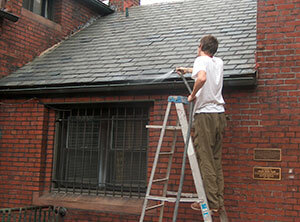 Keeping gutters and downspouts cleared of debris is usually high on the list of regular maintenance activities (Figure 3). Flashing around chimneys, parapets, dormers, and other appendages to the roof also merit regular inspection and appropriate maintenance when needed. The material covering the roof—wood shingles, slate, tile, asphalt, sheet metal, rolled roofing—requires maintenance both to ensure a watertight seal and to lengthen its service life; the type and frequency of maintenance varies with the roofing material. Older chimneys and parapets also require inspection and maintenance. With the exception of cleaning and minor repairs to gutters and downspouts, most roof maintenance work will necessitate use of an outside contractor. Figure 3. Keeping gutters clean of debris can be one of the most important cyclical maintenance activities. On this small one-story addition, a garden hose is being used to flush out the trough to ensure that the gutter and downspouts are unobstructed. Gutters on most small and medium size buildings can be reached with an extension ladder and a garden hose. Photo: Bryan Blundell. cracked masonry or dislodged chimney caps. Remove leaves and other debris from gutters and downspouts. Utilize a ladder with a brace device, if necessary, to keep the ladder from crushing the gutter. Use a garden hose to flush out troughs and downspouts. Patch or repair holes in gutters using products such as fiberglass tape and epoxy adhesive in metal gutters. Avoid asphalt compounds since acidic material can cause further deterioration of metal gutters. Correct misaligned gutters and adjust, if necessary, so that water flows to drains and does not pond. If gutter edges sag, consider inserting wooden wedges between the fascia board and the back of the gutter to add support. Seal leaking seams or pinholes in gutters and elbows. Broom sweep branch or leaf debris away from shingles, valleys, and crickets, particularly around chimneys and dormers. Where mechanical equipment is mounted on flat or low-sloped roofs, ensure that access for maintenance can be provided without damaging the roof. Clean out trapped leaves and debris from around equipment base and consider adding a protective walkway for access. Figure 4. Damage to roofs often requires immediate attention. As a temporary measure, this damaged roof tile could be replaced with a brown aluminum sheet wedged between the existing tiles. Photo: Chad Randl. 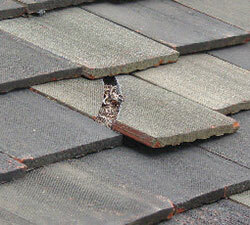 Remove biological growth where it is causing erosion or exfoliation of roofing. Use low-pressure garden hose water and a natural or nylon scrubbing brush to remove such growth, scraping with a plastic putty knife or similar wood or plastic tool as needed on heavier buildup. Most growth is acidic and while there are products designed to kill spores, such as diluted chlorine bleach, they should be avoided. Even fairly weak formulas can still cause unexpected color changes, efflorescence, or over-splash damage to plantings or surfaces below the roof. Where appropriate, trim adjacent tree branches to increase sunlight on the roof since sunlight will deter further biological growth. Re-secure loose flashing at the dormers, chimneys or parapets. Clean out old mortar, lead, lead wool, or fastening material and make sure that flashing is properly inserted into reglet (slot) joints, taking care not to damage the substrate. Avoid installing new step flashing as a single metal component where multiple pieces are required to provide proper waterproofing. Also avoid attaching step flashing with mastic or sealant. Properly re-bed all step flashing. Use appropriate non-ferrous flashing metal or painted metal if needed. Since cap, step, valley, cricket, and apron flashings each have specific overlap and extension requirements, replacement flashing should match the existing material unless there has been a proven deficiency. Repoint joints in chimneys, parapet, or balustrade capping stones using a hydraulic lime mortar or other suitable mortar where the existing mortar has eroded or cracked, allowing moisture penetration. In general, a mortar that is slightly weaker than the adjacent masonry should be used. This allows trapped moisture in the masonry to migrate out through the mortar and not the masonry. Spalled masonry is often evidence of the previous use of a mortar mix that was too hard. Figure 5. The use of a sealant to close an exposed joint is not always an effective long-term solution. Where this decorative wood element connects to the slate roof, the sealant has failed within a short time and a proper metal flashing collar is being fitted instead. Photo: Bryan Blundell. Use professional services to repair chimneys and caps. Avoid the use of mortar washes on masonry since they tend to crack, allowing moisture to penetrate and promoting masonry spalling. Repoint masonry with a durable mortar that is slightly weaker than the adjacent masonry. Slope the masonry mortar cap to insure drainage away from the flue. If a chimney rain cap is installed, ensure adequate venting and exhaust. As a temporary measure, slip pieces of non-corrosive metal flashing under or between damaged and missing roofing units until new slate, shingles, or tile can be attached. Repair broken, missing or damaged roofing units with ones that match. Follow roofing supplier and industry guidance on inserting and attaching replacement units (Figure 4). Avoid using temporary asphalt patches as it makes a proper repair difficult later on. For long-term preservation of wooden shingle roofs coated with a preservative, recoat every few years following the manufacturer’s recommendations. Be aware of environmental considerations. Scrape and repaint selected areas of coated ferrous metal roofing as needed; repaint on a regularly scheduled basis. Ferrous metal roofs can last a long time if painted regularly. Alkyd coatings are generally used on metal roofs; be sure to wash and properly prepare the area beforehand. Environmental regulations may restrict the use of certain types of paints. Apply the coating system in accordance with manufacturer’s recommendations. Prepare the surface prior to application to obtain good adhesion with the prime coat. Apply both a prime coat and a topcoat for good bonding and coverage; select primer and topcoat products from the same manufacturer. Re-secure loose decorative elements, such as finials and weathervanes. Seek professional advice if decorative elements exhibit considerable corrosion, wood rot, or structural instability. Small surface cracks may benefit from a flexible sealant to keep moisture out; sealants have a limited life and require careful inspection and periodic replacement (Figure 5). Figure 6. Stucco applied to an exterior wall or foundation was intended to function as a watertight surface. Unless maintained, rainwater will penetrate open joints and cracks that may occur over time. 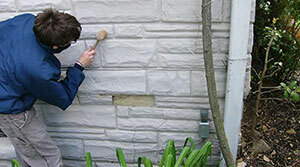 A spa lied section of stucco indicates some damage has occurred and a wooden mallet is being used to tap the surface to determine whether the immediate stucco has lost adhesion. Photo: Bryan Blundell. Exterior walls are designed to help prevent water infiltration, control air infiltration, and serve as a barrier for unwanted animals, birds and insects. The primary maintenance objective is to keep walls in sound condition and to prevent water penetration, insect infestation, and needless decay (Figure 6). Depending on the materials and construction methods, walls should have an even appearance, free from unwanted cracks, and should be able to shed excess moisture. Where surfaces are significantly misaligned or where there are bulging wall sections or cracks indicative of potential structural problems, seek professional guidance as to the cause of distress and appropriate corrective measures. Wood-frame construction generally will require more frequent maintenance than buildings constructed of brick, stone, or terra cotta (Figure 7). Figure 7. One of the advantages of wood shingles as a wall covering is that individual shingles that are damaged can easily be replaced. 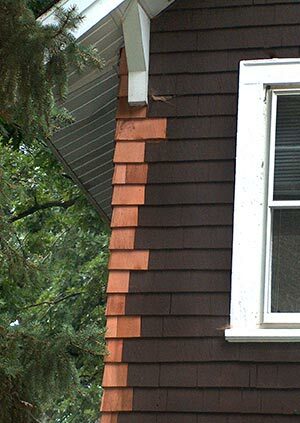 On this highly exposed corner, worn shingles have been selectively replaced to help safeguard against water damage. The new shingles will be stained to match the existing shingles. General paint problems (Figure 8). 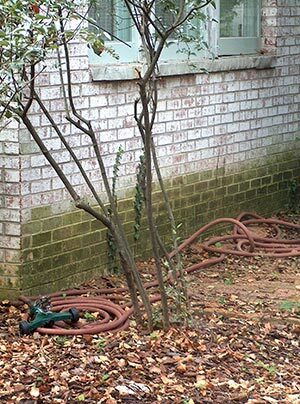 Trim tree branches away from walls. Remove ivy and tendrils of climbing plants by first cutting at the base of the vine to allow tendrils to die back, and later using a plastic scraper to dislodge debris and an appropriate digging tool to dislodge and remove root systems. Be cautious if using a commercial chemical to accelerate root decay; follow safety directions and avoid contact of chemicals with workers and wall materials. Wash exterior wall surfaces if dirt or other deposits are causing damage or hiding deterioration; extend scheduled times for cleaning for cosmetic purposes to reduce frequency (Figure 9). When cleaning, use the gentlest means possible; start with natural bristle brushes and water and only add a mild phosphate-free detergent if necessary. Use non-abrasive cleaning methods and low-pressure water from a garden hose. For most building materials, such as wood and brick, avoid abrasive methods such as mechanical scrapers and high-pressure water or air and such additives as sand, natural soda, ice crystals, or rubber products. All abrasives remove some portion of the surface and power-washing drives excessive moisture into wall materials and even into wall cavities and interior walls. If using a mild detergent, two people are recommended, one to brush and one to prewet and rinse. When graffiti or stains are present, consult a preservation specialist who may use poultices or mild chemicals to remove the stain. If the entire building needs cleaning other than described above, consult a specialist. Figure 8. The paint on the siding of this south-facing wall needs to be scraped, sanded, primed and repainted. Postponing such work will lead to further paint failure, require greater preparatory costs, and could even result in the need to replace some siding. Photo: Charles Fisher. Repoint masonry in areas where mortar is loose or where masonry units have settled. Resolve cause of cracks or failure before resetting units and repointing. Rake out joints by hand, generally avoiding rotary saws or drills, to a depth of 2 ½ times the width of the joint (or until sound mortar is encountered), to make sure that fresh mortar will not pop out. Repointing mortar should be lime-rich and formulated to be slightly weaker than the masonry units and to match the historic mortar in color, width, appearance, and tooling. Off-the-shelf pre-mixed cement mortars are not appropriate for most historic buildings. Avoid use of joint sealants in place of mortar on vertical masonry wall surfaces, as they are not breathable and can lead to moisture-related damage of the adjacent masonry (Figure 10). Correct areas that trap unwanted moisture. Damaged bricks or stone units can sometimes be removed, turned around, and reset, or replaced with salvaged units. When using traditional or contemporary materials for patching wood, masonry, metal, or other materials, ensure that the materials are compatible with the substrate; evaluate strength, vapor permeability, and thermal expansion, as well as appearance. When patching is required, select a compatible patch material. Prepare substrate and install patch material according to manufacturer’s recommendations; respect existing joints. Small or shallow surface defects may not require patching; large or deep surface defects may be better addressed by installation of a dutchman unit than by patching. Figure 9. To help extend a repainting cycle, dirt and spider webs should be removed before permanent staining occurs. In this case, a natural bristle brush and a soft damp cloth are being used to remove insect debris and refresh the surface appearance. Where a damaged area is too large to patch, consider replacing the section with in-kind material. For stucco and adobe materials, traditional patching formulas are recommended. When temporarily removing wood siding to repair framing or to tighten corner boards and loose trim, reuse the existing siding where possible. Consider using stainless steel or high strength aluminum nails as appropriate. Putty or fill nail holes flush with siding prior to repainting. Back-prime any installed wood with one coat of primer and coat end grain that might be exposed with two coats of primer. Prepare, prime, and spot paint areas needing repainting. Remember that preparation is the key to a successful long lasting paint job. Ensure beforehand the compatibility of new and existing paints to avoid premature paint failure. Remove loose paint to a sound substrate; sand or gently rough surface if needed for a good paint bond; wipe clean; and repaint with appropriate primer and topcoats. Follow manufacturer’s recommendations for application of coatings, including temperature parameters for paint application. Use top quality coating materials. Generally paint when sun is not shining directly onto surfaces to be painted. Remove deteriorated caulks and sealants, clean, and reapply appropriate caulks and sealants using backer rods as necessary. Follow manufacturer’s instructions regarding preparation and installation. Correct deficiencies in any wall attachments such as awning and flag pole anchors, improperly installed electrical outlets, or loose water spigots. Exterior wall openings primarily consist of doors, windows, storefronts, and passageways. The major maintenance objectives are to retain the functioning nature of the opening and to keep in sound condition the connection between the opening and the wall in order to reduce air and water infiltration. window well debris accumulation, heavy bird droppings, and termite and carpenter ant damage. Replace broken or missing glass as soon as possible; in some cases cracked glass may be repaired using specialty glues. For historic crown glass and early cylinder glass, a conservation approach should be considered to repair limited cracks. Where panes with a distinct appearance are missing, specialty glass should be obtained to match, with sufficient inventory kept for future needs. Avoid using mechanical devices to remove old putty and match historic putty bevels or details when undertaking work. Reputty window glazing where putty is deteriorated or missing. Take care in removing putty so as not to crack or break old glass or damage muntins and sash frames. Re-glaze with either traditionally formulated oil putties or modern synthetic ones, making sure to properly bed the glass and secure with glazing points (Figure 11). Clean window glass, door glazing, storefronts, transom prism lights, garage doors, and storm panels using a mild vinegar and water mixture or a non-alkaline commercial window cleaner. Be cautious with compounds that contain ammonia as they may stain brass or bronze hardware elements if not totally removed. When using a squeegee blade or sponge, wipe wet corners with a soft dry cloth. Avoid high-pressure washes. Clean handles, locks and similar hardware with a soft, damp cloth. Use mineral spirits or commercial cleaners very sparingly, as repeated use may remove original finishes. Most metal cleaners include ammonia that can streak and stain metal, so it is important to remove all cleaning residue. Polished hardware subject to tarnishing or oxidation, particularly doorknobs, often benefits from a thin coat of paste wax (carnauba), hand buffed to remove extra residue. Avoid lacquer finishes for high use areas, as they require more extensive maintenance. Patinated finishes should not be cleaned with any chemicals, since the subtle aged appearance contributes to the building’s character. 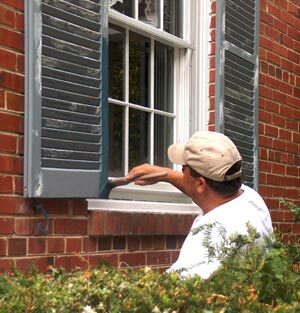 Remove and clean hardware before painting doors and windows; reinstall after the paint has dried. Tighten screws in doorframes and lubricate door hinges, awning hardware, garage door mechanisms, window sash chains, and pulleys using a graphite or silicone type lubricant. Check weather stripping on doors and windows and adjust or replace as necessary. Use a durable type of weather stripping, such as spring metal or high quality synthetic material, avoiding common brush and bulb or pile weather stripping that require more frequent replacement. Adjust steel casement windows as needed for proper alignment and tight fit. Avoid additional weather stripping as this may lead to further misalignment, creating pathways for air and water infiltration. Check window sills for proper drainage. Fill cracks in wood sills with a wood filler or epoxy. Follow manufacturer’s instructions for preparation and installation. Do not cover over a wood sill with metal panning, as it may trap moisture and promote decay. 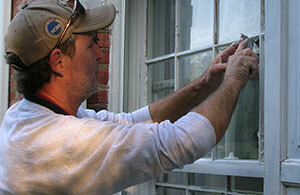 Repair, prime, and repaint windows, doors, frames, and sills when needed. Clean out putty debris and paint chips from windows using a wet paper towel and dispose of debris prior to repair or repainting. Take appropriate additional precautions when removing lead-based paint. Sand and prepare surfaces and use material-specific patching compounds to fill any holes or areas collecting moisture (Figure 12). Avoid leaving exposed wood unpainted for any length of time, as light will degrade the wood surface and lead to premature failure of subsequent paint applications. Immediately prime steel sash after paint is removed and the substrate prepared for repainting. Adjust wood sash that bind when operated. Apply beeswax, paraffin, or similar material to tracks or sash runs for ease of movement. If sash are loose, replace worn parting beads. 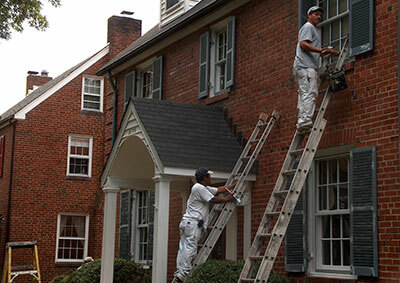 Sash runs traditionally were unpainted between the stop and parting bead; removing subsequent paint applications will often help improve sash operation. Correct perimeter cracks around windows and doors to prevent water and air infiltration. Use traditional material or modern sealants as appropriate. If fillers such as lead wool have been used, new wool can be inserted with a thin blade tool, taking care to avoid damage to adjacent trim. Reduce excess air infiltration around windows by repairing and lubricating sash locks so that windows close tightly. Remove debris beneath window air conditioning units and ensure that water from units does not drain onto sills or wall surfaces below (Figure 13). Removal of air conditioning units when not in season is recommended. Adjust storm panels and clean weep holes; check that weep holes at the bottom of the panels are open so water will not be trapped on the sill. Exterior applied storm windows are best attached using screws and not tightly adhered with sealant. Use of sealant makes storm units difficult to remove for maintenance and can contribute to moisture entrapment if weep holes become clogged. Remove weakened or loose shutters and store for later repair. Consider adding a zinc or painted metal top to shutters as a protective cap to cover the wood’s exposed end grain. This will extend the life of the shutters. Figure 12. Good surface preparation is essential for long lasting paint. Scraping loose paint, filling nail holes and cracks, sanding, and wiping with a damp cloth prior to repainting are all important steps whether touching up small areas or repainting an entire feature. Always use a manufacturer's best quality paint. Windows and shutters may need repainting every five to seven years, depending on exposure and climate. Figure 13. 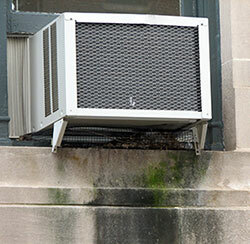 Window air conditioning units can cause damage to surfaces below when condensation drips in an uncontrolled manner. Drip extension tubes can sometimes be added to direct the discharge. Become familiar with work done on similar historic properties in your area so that you can obtain names of possible preservation contractors. Be as specific as possible in defining the scope of work you expect to undertake. Ask potential contractors for multiple references (three to five) and visit previous work sites. Contact the building owner or manager and ask how the job proceeded; if the same work crew was retained from start to finish; if the workers were of a consistent skill level; whether the project was completed in a reasonable time; and whether the person would use the contractor again. Be familiar with the preservation context of the work to be undertaken. Use the written procedures in your maintenance plan to help define the scope of work in accordance with preservation standards and guidelines. Always request that the gentlest method possible be used. Use a preservation consultant if necessary to ensure that the work is performed in an appropriate manner. Request in the contract proposal a detailed cost estimate that clearly defines the work to be executed, establishes the precautions that will be used to protect adjoining materials, and lists specific qualified subcontractors, if any, to be used. Insure that the contractor has all necessary business licenses and carries worker compensation. Numerous projections may exist on a historic building, such as porches, dormers, skylights, balconies, fire escapes, and breezeways. They are often composed of several different materials and may include an independent roof. Principal maintenance objectives include directing moisture off these features and keeping weathered surfaces in good condition. Secondary projections may include brackets, lamps, hanging signs, and similar items that tend to be exposed to the elements. rust and excessive wear of structural, anchorage, and safety features of balconies and fire escapes. Selectively repair or replace damaged roofing units on porches and other projections. Ensure adequate drainage away from the building. Repair flashing connections as needed; clean and seal open joints as appropriate. Secure any loose connections, such as on porch rails or fire escapes. Maintain ferrous metal components by following manufacturer’s recommendation for cleaning and repainting. Remove rust and corrosion from porch handrails, balconies, fire escapes, and other metal features; prepare, prime, and repaint using a corrosion-inhibitive coating system. Apply new primer before new corrosion sets in, followed by new topcoat. Take appropriate safety measures when dealing with existing lead-based paint and in using corrosion-removal products (Figure 15). Reattach loose brackets, lamps, or signs. With electrical boxes for outlets or lighting devices, ensure that cover plates are properly sealed. Prime and paint metal elements as needed. Keep porch decks and steps free from dust, dirt, leaf debris, and snow as soon at it accumulates using a broom or plastic blade shovel. Repair areas of wood decay or other damage to railings, posts, and decorative elements. Repair with wood dutchman, wood putty, or epoxy filler, as appropriate; replace individual elements as needed. Prime and repaint features when necessary and repaint horizontal surfaces on a more frequent basis. Sand and repaint porch floorboards to keep weather surfaces protected. The exposed ends of porch floorboards are especially susceptible to decay and may need to be treated every year or two. Carefully cut out damaged or buckled porch flooring and replace with wood to match. Back-prime new wood that is being installed; treat end grain with wood preservative and paint primer. Ensure that new wood is adequately kiln or air-dried to avoid shrinkage and problems with paint adherence. Repair rotted stair stringers; adjust grade or add stone pavers at stair base to keep wooden elements from coming into direct contact with soil. Consider durable hardwoods for replacement material where beading, chamfering, or other decorative work is required in order to match existing features being replaced. Although appropriate for certain applications, pressure treated lumber is hard to tool and may inhibit paint adherence if not allowed to weather prior to coating application. Clean out any debris from carpenter bees, ants, termites, and rodents, particularly from under porches. Replace damaged wood and add screening or lattice to discourage rodents. Consider treating above ground features with a borate solution to deter termites and wood rot and repaint exposed surfaces. The foundation walls that penetrate into the ground, the piers that support raised structures, and the ground immediately around a foundation (known as grade) serve important structural functions. To help sustain these functions, it is important that there is good drainage around and away from the building. The maintenance goal is to prevent moisture from entering foundations and crawl spaces and damaging materials close to the grade, and to provide ventilation in damp areas. Figure 16. This chronically wet area has a mildew bloom brought on by heat generated from the air-conditioning condenser unit. The dampness could be caused be a clogged roof gutter, improper grading, or a leaking hose bibb. blocked downspout drainage boots or clogged areaway grates. Remove leaves and other debris from drains to prevent accumulation. Detach drain grates from paved areas and extract clogged debris. Flush with a hose to ensure that there is no blockage. Use a professional drain service to clear obstructions if necessary. Conduct annual termite inspections. Promptly address termite and other insect infestations. Use only licensed company for treatment where needed. Keep the grade around the foundation sloping away from the building. Add soil to fill depressions particularly around downspouts and splash blocks. Make sure that soil does not come too close to wooden or metal elements. A 6” separation between wooden siding and the grade is usually recommended. Avoid use of mulching material immediately around foundations as such material may promote termite infestation, retain moisture or change existing grade slope. Reset splash blocks at the end of downspouts or add extender tubes to the end of downspouts as necessary (Figure 17). Lubricate operable foundation vent grilles to facilitate seasonal use; paint as needed. Manage vegetation around foundations to allow sufficient air movement for wall surfaces to dry out during damp periods. Trim plantings and remove weeds and climbing vine roots. Be careful not to scar foundations or porch piers with grass or weed cutting equipment. If tree roots appear to be damaging a foundation wall, consult an engineer as well as a tree company. Wash off discoloration on foundations caused by splash-back, algae, or mildew. Use plain water and a soft natural or nylon bristle brush. Unless thoroughly researched and tested beforehand on a discreet area of the wall, avoid chemical products that may discolor certain types of stone. If cleaning products are used, test beforehand in a discreet area; and avoid over splash to plantings and adjacent building materials. Selectively repoint unit masonry as needed. Follow guidance under the wall section in regard to compatible mix, appearance, and texture for pointing mortar. Avoid using salts for de-icing and fertilizers with a high acid or petro-chemical content around foundations, as these materials can cause salt contamination of masonry. Use sand or organic materials without chloride additives that can damage masonry. Where salt is used on icy walks, distribute it sparingly and sweep up residual salt after walks have dried. Use snow shovels and brooms to clean snow from historic paths and walkways. Avoid blade-type snow removers as they may chip or abrade cobblestones, brick, or stone paving. Note that use of steel snow removal tools in areas where salt-containing snow melters are used may result in rust staining from steel fragments left on the paving. Using sealants and caulks has become a familiar part of exterior maintenance today. As the use of precision joinery and certain traditional materials to render joints more weathertight has waned in recent years, caulks and more often elastomeric sealants are used to seal cracks and joints to keep out moisture and reduce air infiltration. Where cracks and failing joints are indicators of a serious problem, sealants and caulks may be used as a temporary measure. In some cases they may actually exacerbate the existing problem, such as by trapping moisture in adjacent masonry, and lead to more costly repairs. Manufacturer’s recommendations provide instructions on the proper application of caulks and sealants. Special attention should be placed on ensuring that the subsurface or joint is properly prepared and cleaned. Backer rods may be necessary for joints or cracks. Tooling of the caulk or sealant is usually necessary to ensure contact with all edge surfaces and for a clean and consistent appearance. Caulks generally refer to older oil resin-based products, which have relatively limited life span and limited flexibility. Contemporary elastomeric sealants are composed of polymer synthetics. Elastomeric sealants are more durable than caulks and have greater flexibility and wider application. Caulks and sealants can become maintenance problems, as they tend to deteriorate faster than their substrates and must be replaced periodically as a part of cyclical maintenance of the structure. The selection criteria for caulks and sealants include type of substrate, adhesion properties, size and configuration of joint, intended appearance/color and paintability, movement characteristics, and service life. Both one-part and two-part sealants are available; the latter require mixing as part of the application process. 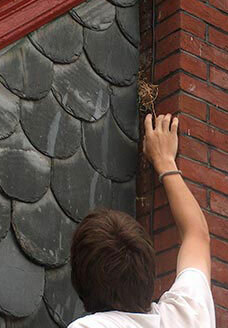 Sealants are commonly used for a variety of places on the exterior of a building such as around windows and doors, at interfaces between masonry and wood, between various wood features or elements, and at attachments to or through walls or roofs, such as with lamps, signs, or exterior plumbing fixtures. Their effectiveness depends on numerous factors including proper surface preparation and application. Applications of sealants and caulks should be examined as part of routine maintenance inspection, irrespective of their projected life expectancy. Installation of caulks and sealants often can be undertaken by site personnel. For large and more complex projects, a contactor experienced in sealant installation may be needed. In either case, the sealant manufacturer should be consulted on proper sealant selection, preparation, and installation procedures. Figure 17. 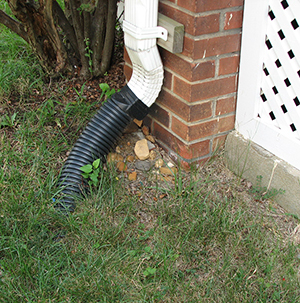 Extending downspouts at their base is one of the basic steps to reduce dampness in basements, crawl spaces and around foundations. Extensions should be buried, if possible, for aesthetics, ease of lawn care, and to avoid creating a tripping hazard. Photo: NPS files. Maintenance is the most important preservation treatment for extending the life of a historic property. It is also the most cost effective. 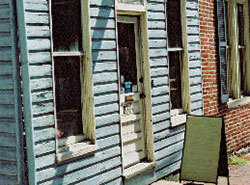 Understanding the construction techniques of the original builders and the performance qualities of older building materials, using traditional maintenance and repair methods, and selecting in-kind materials where replacements are needed will help preserve the building and its historic character. Maintenance can be managed in small distinct components, coordinated with other work, and scheduled over many years to ensure that materials are properly cared for and their life span maximized. A written maintenance plan is the most effective way to organize, schedule, and guide the work necessary to properly care for a historic building. The maintenance plan should include a description of the materials and methods required for each task, as well as a schedule for work required for maintenance of different building materials and components. Historic house journals, maintenance guides for older buildings, preservation consultants, and preservation maintenance firms can assist with writing appropriate procedures for specific properties. Priorities should be established for intervening when unexpected damage occurs such as from broken water pipes or high winds. Worker safety should always be paramount. When work is beyond the capabilities of in-house personnel and must be contracted, special efforts should be made to ensure that a contractor is both experienced in working with historic buildings and utilizes appropriate preservation treatments. A well-maintained property is a more valuable property and one that will survive as a legacy for generations to come. 1. The Secretary of the Interior’s Standards for the Treatment of Historic Properties. Washington, D.C.: U.S. Department of the Interior, National Park Service, 1995. 2. Committee on Advanced Maintenance Concepts for Buildings et al, Committing to the Cost of Ownership: Maintenance and Repair of Public Buildings, Washington, D.C.: National Academy Press, 1990. Sharon C. Park FAIA, is the former Chief of Technical Preservation Services, Heritage Preservation Services, National Park Service, in Washington, D.C. and currently is the Associate Director for Architectural History and Historic Preservation, Smithsonian Institution. The author wishes to thank Mike Seibert of the National Park Service for research on the project and the development of the charts; and Lauren Burge, AIA, of the firm of Chambers, Murphy & Burge, and Michael Emerick, AIA, for sharing their expertise on maintenance and providing early guidance. Thanks go to Deborah Slaton of the firm of Wiss, Janney, Elstner Associates, Inc., for her insightful contributions and also to Rebecca Stevens of the National Park Service, Dominque Hawkins, AIA, of Preservation Design Partnership, J. Bryan Blundell of Dell Corporation, and Michael Scheffler and Kenneth Itle of Wiss, Janney, Elstner Associates, Inc. Also gratefully acknowledge for their assistance in the technical review and editing of this publication are Charles E. Fisher, Anne E. Grimmer, and Chad Randl of the National Park Service’s Technical Preservation Services, and former staff Kay D. Weeks. Numerous other National Park Service staff and partners commented on the manuscript and made substantial contributions. This publication has been prepared pursuant to the National Historic Preservation Act, as amended, which directs the Secretary of the Interior to develop and make available information concerning historic properties. Comments about this publication should be made to: Charles Fisher, Technical Publications Program Manager, Technical Preservation Services-2255, National Park Service, 1849 C Street, NW, Washington, D.C. 20240. This publication is not copyrighted and can be reproduced without penalty. Normal procedures for credit to the author and the National Park Service are appreciated. Unless otherwise noted, photographs in this Brief are by Sharon C. Park, FAIA. Except for the author’s photos, the photographs used in this publication may not be used to illustrate other publications without permission of the owner. Fisher, Charles E. and Hugh C. Miller, eds. Caring For Your Historic House. New York, NY: Harry N. Abrams, Inc., 1998. Fisher, Charles E., Deborah Slaton, and Rebecca Shiffer, eds. Window Rehabilitation Guide for Historic Buildings. Washington, D.C.: Historic Preservation Education Foundation, 1997. Fram, Mark. Well-Preserved: The Ontario Heritage Foundation’s Manual of Principles and Practice for Architectural Conservation. Erin, Ontario: The Boston Mills Press, 1988. Gayle, Margot, David W. Look, AIA, and John G. Waite, FAIA. Metals in America’s Historic Buildings: Use and Preservation Treatments. Washington, D.C.: National Park Service, 1992. Grimmer, Anne E. Keeping It Clean: Removing Exterior Dirt, Paint, Stains & Graffiti from Historic Masonry Buildings. Washington, D.C.: National Park Service, 1988. Jester, Thomas C., ed. Twentieth Century Building Materials: History and Conservation. New York, NY: McGraw-Hill, 1995. Leeke, John C. Practical Restoration Reports Compendium. Portland, ME: Historic HomeWorks, 2005. London, Mark. 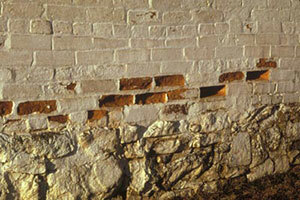 Masonry: How to Care for Old and Historic Brick and Stone. Washington, D.C.: The Preservation Press, 1988. Preservation Briefs. Washington, D.C.: National Park Service. The collection of Preservation Briefs assist owners and developers of historic buildings in recognizing and resolving common preservation, maintenance and repair problems. Preservation Tech Notes. Washington, D.C.: National Park Service. The collection of Preservation Tech Notes provides guidance and case studies on the care and maintenance of historic structures. Yapp, Bob and Rich Binsacca. About Your House with Bob Yapp. San Francisco, CA: KQED Books & Tapes, 1997.